Discussion in 'Pokémon TCG Discussion' started by TRJessie579, Jul 3, 2006. Yes, due to the sudden explosion of these kinds of threads, I’ve decided to make a sticky for the sole purpose of finding out the rarity or the value of your cards. You can either post here with your question or actually read the FAQ and do a little bit of work, which will probably answer your question. How rare is my card? Different cards have different rarities, and for the most part, they are based on the symbol in the lower right-hand corner of your card. Circle: Common. There are 7 of these in an 11-card booster, and 5 in a 9-card booster. Diamond: Uncommon. There are 3 of these in an 11-card booster, and 2 in a 9-card booster. Star: Rare. There is only 1 of these in each booster. Star with HOLO picture: Holographic rare. This will be the rare in 1 in every 3 boosters. EX Pokemon: These Pokemon will have “ex” after their name on the card. Depending on the set, there can be anywhere from 6 to 2/3 EX cards in a box of 36 packs. Shining Pokemon: These Pokemon have “Shining” in front of their names and came in the Neo Revelation and Neo Destiny sets. I do not know their exact rarity, but they ARE rarer than the normal holos of those sets. Pokemon *: These Pokemon have a * symbol after their names, and can be found in many of the new EX sets. I believe they are usually only found once per box. Secret Cards/Boxtoppers: These cards will all have card numbers that are ABOVE the actual number of cards in the set. For example, 101/100. Boxtoppers are cards that you can only find by buying a booster box, and they will be lying on top of the boosters when you open them. The secret cards are found in packs, and their rarity varies by set. Reverse/Alternate Holo: These cards come one per pack since the Legendary Collection set, and have a “reverse” or “alternate” holographic pattern on them. There is one RH/AH version for every regular card in the set, except for EX Pokemon and secret cards/boxtoppers. From the Legendary Collection set through the Team Aqua/Team Magma set, these cards were holographic around the main part of the card, and just not in the picture. In the following sets, they had an alternate holo pattern on the card picture, and/or a special stamp of the set name. How much is my card worth? To find the actual amount of money your card will sell for, you may just want to look up the finished auctions on eBay to see what people are paying for them. If you are a member of the PokeGym forums, you can check out their Price List, which is usually accurate and up-to-date. The only other important thing to remember about card worth is that newer cards are almost ALWAYS worth more than older cards. This is because the Modified format, the format used in all official tournaments, is updated every year to include only the newest sets. This means that people can not use older cards in their decks for premier tourneys, and so they are not worth as much in general, as they are not as sought-after. If you’re looking for a price/rarity of your card, please include the set and card number, or barring that (if it’s in Japanese and you can’t read it, etc), any other information you can about the card. If you say “I have a Pikachu, what’s it worth?” we will have no idea what card you are talking about. If you’re answering people with a price for their card, please post where you are getting your prices from. Also keep in mind that book prices (prices that can be found in magazines like Beckett) are usually around 3 times the actual worth of the card (what people will actually pay for it). I believe that’s it, post away! Hey mods, guess what, theres a spam post in a thread in a forum. Im not gunna tell you where! You have ot look for it! Lol! And when you dont find that specific post in that specific thread wihtin 5 MINUTES... Im gunna post a thread to complain about your poor modding behavior =( *****es. HOW DARE YOU NOT UNDERSTAND ME!?!??! Now start searching. 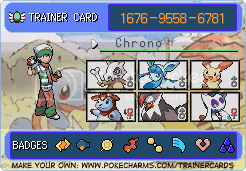 ..beat me and earn a BLACKFLAME GYM BADGE. I was just wondering how much they are actually worth. Subliminal rules: how to live, how to die. dude-z < My first Shiny!!!! I'm wondering about the worth of this card. Nice to meet you Rose, Run for your life! I claimed Mercinaries: Playground of Destruction for XBOX as my video game! Take the Naruto character test! Kitt Kat Why is the rum gone? Could someone tell me how much these are worth? I would really appreciate it! "POKÉMON!? Pokemon with the Poké and the Mon and the thing where the guy comes out of the thing, and he makes a fraaagh fr fra aagh aagh aagh!" Articuno EX (EX FR/LG) Medium condition, has no rips but is very wavy. I generally go by what the going rate on E-bay is for these cards since it's far more accurate as to what you're really going to get if you try to sell them....especially to a comic shop. All but Mightyena, Kyogre, Swampert and Flareon range from $3-$8, depending on condition. Mighty generally goes for $12-$15, Kyogre for $12-$15, Flare for $12-$15 and Swamp for $15-$18. My Koga's Ditto and ditto FR/LG? Depending on the condition(and if K's Ditto is a 1st ed. ), around $3. Edit: BTW, the rariety of the Shiny Pokemon from the EX sets is 1 per 3 boxes(or 108 packs). I think stars are actually 1 per 3 boxes and I helped someone open a box of Holon Phantoms and they only got 1 ex (Mew). I dunno, butr I think I got ignored.. Anything that isn't in mint condition isn't worth selling. There really isn't a market for cards that aren't in excellent condition. Everything else is $3, except Cacturne which can go for about $10. What about that Diglett from the Base Set with the side ways energy? I have a mint condition Ancient Mew card that I got when I watched the 2nd Movie. Anyone know how much it is worth? According to Pokeorder.com, it should be no more than eight dollars. Ancient Mew US version cards generally sell for $2-$3. American promo cards aren't worth a lot due to the distribution. Unlike Japanese cards which are produced in far more limited quantities, US cards are mass produced and distributed, in some cases, at multiple times in multiple ways. How much would my German Holo Mew from EX Legend Maker be? I claimed Sprocket in the Claim a Animal Crossing character Thread. Sprocks Rocks!